Posted in: Integy, Radio Control. Tagged: New Releases, RC, Upgrades. 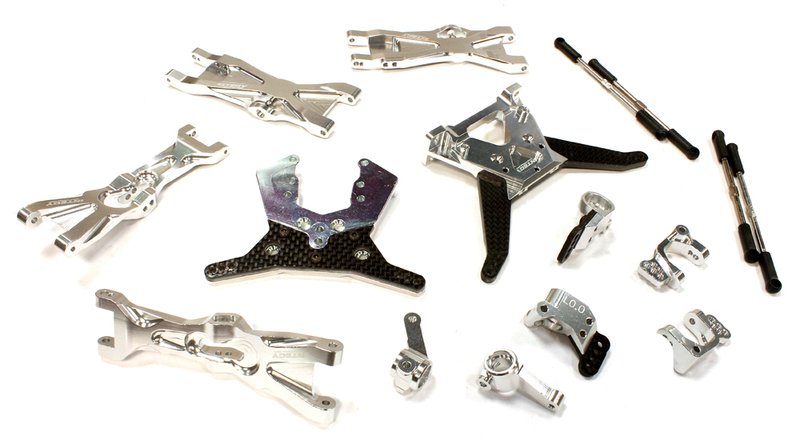 Integy rolls out a complete Billet Machined Suspension Kit for the Team Associated SC10.2 Short Course truck. Parts included in the kit are front alloy and rear lower suspension arms, carbon fiber and alloy front and rear shock towers, alloy front and rear hubs, alloy front c-carriers, and front and rear adjustable turnbuckles. The kit is available in Blue Part# C25644BLUE, Gunmetal Part# C25644GUN and Silver C25644SILVER. MSRP is $149.99. The kits should be in stores soon.